Mumbai, May 8 (IANS) American TV show “Quantico”, the pilot of which was shot with Bollywood actress Priyanka Chopra essaying the female lead, has been picked for telecast by TV network ABC. It will air in fall season. The 32-year-old actress also shared a photograph of the cast of the show along with her tweet. Priyanka, who is the first Bollywood actress to star in a pilot at ABC and has made her space in the West with her singing talent, plays Alex Parrish, a half-Caucasian, half-Indian FBI trainee with a haunting past. The show centres on a diverse group of recruits who have arrived at the FBI Quantico Base for training. Being the best and brightest of the lot, it seems impossible that one of them is suspected of masterminding the biggest attack on New York City since 9/11, according to deadline.com. 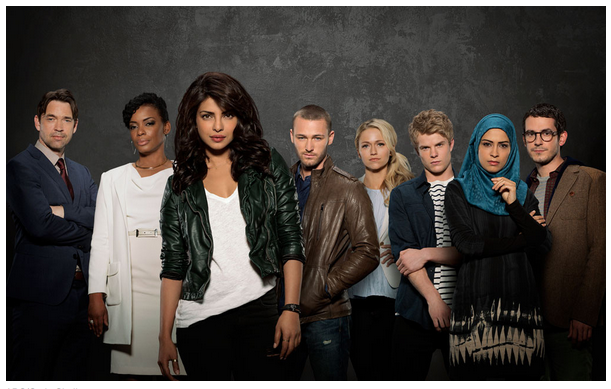 “Quantico” also stars Dougray Scott as Liam, Jake McLaughlin as Ryan, Aunjanue Ellis as Miranda, Yasmine Al Massri as Nimah, Johanna Braddy as Shelby, Tate Ellington as Simon Asher and Graham Rogers as Caleb Haas. The series is written by Josh Safran. Executive producers are Josh Safran, Mark Gordon and Nick Pepper.